The boutique fitness franchise is taking over, and we're lucky for it. F45 studios may have just started cropping up in Dallas, but they’re practically an institution in the brand’s native land of Australia. Seriously, they’re everywhere there; a fact I confirmed with a real, live Australian at a fitness-related event last week. Now, the six-year-old, fast growing fitness franchise is spreading that ubiquity worldwide, with a growing presence in the US over the last couple of years. By the looks of it, Dallas is set to have about seven franchised locations opening soon. One of the first local F45 studios to open its doors is F45 Dallas Main Street, situated just across from The Joule downtown. I gave it a try because of its timely debut, but also because they have the best Instagram presence of any local F45 by far (so far), and these days, that counts. The Class: I took “Panthers” on a Tuesday at 5:30pm, but F45 has developed 31 different circuit-based strength and conditioning workouts (all 45 minutes long) that are featured at each location. The workouts assigned to each class time seem to switch every few weeks or so (the current workout held at that 5:30pm time slot is “Romans”), but really, no two workouts you do at F45 should be the same. 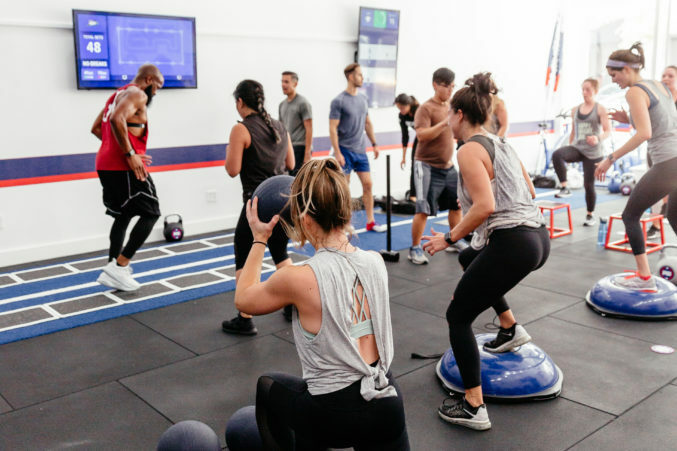 The Appeal: The “F” in F45 stands for functional training, which adapts day-to-day movements into exercises, though the class also incorporates HIIT and circuit training. The no-treadmill-necessary workouts rotate consistently, but F45 ensures that each studio sticks to the same schedule, so if you happen to be in London, you can pop into an F45 and know what to expect. The Instructor: Taylor Cummins, one of the three co-owners of this Dallas Main Street F45. The Space: A clean, white studio with a touch of Aussie-inspired blue, white, and red. It’s a small space, but the intimacy can be a powerful motivator. How It Went: Fast. Circuit-based classes always fly for me, but this one went particularly quick. We went through about 18 different stations, each with their own functional movement that utilized kettle bells, ropes, exercise balls, free weights, and more. A handful of strategically placed plasma screens displayed the countdown clock (60 seconds) for each exercise and a demonstration for what each exercise should look like (à la Orangetheory). Cummins walked around the room to motivate and check our form. The Aftermath: I felt simultaneously awesome and destroyed. I used every muscle of my body in that class, so the soreness was *real. * If I was prepping for my wedding or some such important, highly photographed event, F45 would be my go-to. Bottom Line: I loved that those 45 minutes flew by, and I deeply appreciated the plasma screens, but the thing that distinguished F45 for me was the vibe of the class. It really did feel like a supportive, non-competitive atmosphere, which is a lovely thing in a circuit-training class. The intimacy of that small studio probably helped, but I think a lot of it had to do with Cummins and his wife, another co-owner named Cayla, whose energy really set the tone for the tough workout.